Jaw crusher is one of the indispensable machines for primary crushing in mining crushing production line, normally it is used in the first crushing process. As a result, the components are always in worse abrasion, especially the jaw plate. 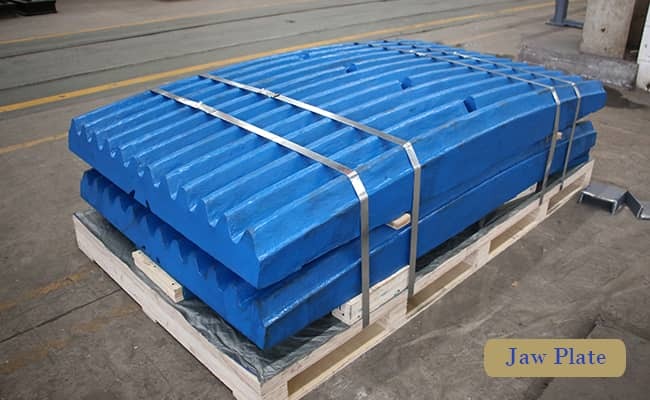 Jaw plate is the connection part that directly touches with the materials while crushing the materials. Its working efficiency is the same as that of the whole crusher. Many people know that they should replace the jaw plate if it’s broken, but many of them didn't pay attention to the cause and how to prolong the service life. The swing jaw makes the compound pendulum movement and forms a certain angle with the jaw plate to extrusion the aggregates when the crusher in working condition. It is discovered from the unload wear jaw plate that the surface of the tooth plate on which is uneven and has the scratch. Therefore, the wear of swing jaw is mainly from the interaction force by extruding materials and the sliding friction between materials and jaw plate. Many manufactures are aware of the broken reason of jaw plate, and take reform to enhance its service life. They mainly focus on the aspects of wear resistance and toughness of jaw plate. By choosing the high resistance and toughness materials to make jaw plate is the current main solution. The new type of jaw plat that made of high manganese steel can greatly improve its service life in order to enhance the working efficiency, and reduce the investment cost of manufactures. To some extent, it reduces the burden of customer. Dahua can offer the high quality spare parts, supply on time and guarantee customer trouble free operation of machine.